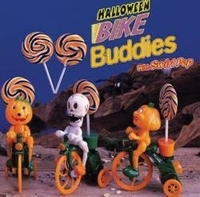 Halloween bike buddies with swirl sucker. This novelty Halloween candy is a perfect treat for kids. You get either a pumpkin or skeleton on a bike each comes with a swirl sucker. wind them up and watch them go.